Are you one of the many companies ready to make employee training a top priority? According to the 2014 Corporate Learning Factbook, U.S. spending on corporate training grew by 15 percent last year (the highest growth rate in seven years). As the demand for employee training grows, so do the delivery options for employers. But how do you know which training format is best for your company and employees? Some skills are best taught in each training format. Let’s explore the many training delivery methods you have to consider. On-site courses are usually held in a traditional classroom format. As long as you have a room large enough to accommodate your group of employees, typically, you only need to hire one trainer. Learning in a group environment boosts individual and team knowledge, refines processes and provides an excellent team building opportunity. Any non-technical skill can be taught in a face-to-face environment. However, all the involved employees must have the ability to be away from their workstations at the same time, which can be a scheduling challenge for some companies. When led by a skilled trainer, on-site classes are effective at strengthening relationships between participants, teams and the trainer, while keeping the individual student’s needs in balance. For example, bringing some of your managers together for a change management course allows them to develop new skills and build good rapport with one another. In addition, by participating in on-site classes with your employees, you can observe their behavior, body language, tone, etc. This can help you evaluate how meaningful the information and experience is to them. The personal element of this training method allows the experience to be heard, seen and felt. Best for: Fostering a team mindset. Live training classes bring employees together in one room, helping them to develop common vocabulary and share best practices. Convenient and flexible online trainings allow each of your employees to participate at their own pace without needing to physically attend a session at a particular time. E-learning courses are often interactive and include video presentations. E-learning can train employees on technical skills and complex policies and procedures that may be hard to articulate in a face-to-face environment. It’s also great for company-wide compliance training or other situations where it may be hard to get everyone trained in a face-to-face setting before a deadline. Many times e-learning courses include knowledge checks, such as short quizzes, along the way that help employees apply what they’ve learned, making retention of the material more likely. These features help overcome the lack of social interaction involved in e-learning courses – the one downside to this training delivery method. Best for: Self-motivated groups of employees who already have access to a computer, staff-wide training goals and very individualized objectives. Mobile learning or m-learning delivers training to mobile technology-savvy employees on their handheld devices. Essentially, m-learning has been equated with any e-learning module that can run on a portable device. Given our short attention spans when using mobile devices, the best m-learning content is chunked into a series of short three to 10-minute lessons. Employees must have a compatible mobile device to participate, which may be easier than ensuring everyone has a computer to use. Employees appreciate the convenience of m-learning and tend to be motivated to complete it. For example, 100 percent of Merrill Lynch employees who participated in m-learning reported afterwards that they would complete more training in this format. Many companies leverage mobile applications like Snapguide to create how-to guides for employees to reference on the job. Guides can include text, photos and video. Users can also make comments, ask questions and share. In many cases, e-learning modules and m-learning are intertwined. E-learning modules can act as the main vehicle for content, while m-learning modules function as a tool for on-demand access to information, learning feedback, advice, support and specific learning materials. When it comes to m-learning, like any educational or training project, determining the process of development most suited to the learners’ needs depends upon a number of factors. This includes: target audiences, available budget, intended purposes and required features. Best for: Employees who travel frequently or are otherwise challenged to find consistent, uninterrupted time at their desks. M-learning facilitates learning “on the move,” and so it is not static or tied to a place; it is learning within context. This may include learning while traveling, driving, sitting, or walking; it may be hands-free learning or auditory-only learning. Gamification training uses game mechanics to engage your employees and help them change behaviors, learn new skills, innovate or solve problems. Gamification is generally considered the application of game thinking to solving problems and encouraging learning using game elements that are appropriate. Generally, this translates into e-learning or m-learning training courses that feel like a game – it may contain elements such as beating the clock, accruing points and/or unlocking new information. For example, to learn better sales skills your employees might play a game that involves defeating anti-sales aliens by answering questions about your products and services. Gamification can also help supplement face-to-face training. It is important to use gamification for the right learning outcomes versus applying these concepts to every learning event. The key to choosing the best training delivery method is to put your company goals and employee needs first. 1. Start by Identifying your immediate and long-term learning and organizational goals. 2. Then, establish your criteria for measuring success. 3. Ensure the option(s) you’re considering will work well with any existing and successful training methods you’re using. 4. Think about which format will be most convenient for your employees and most likely to motivate them to complete the training. 5. Test out your training delivery choice with a representative group of employees to be sure it meets your goals before you roll it out to all participants. Remember, when determining the best training delivery method, don’t just focus on one factor, such as employee convenience or total cost, to govern your choice. It is not the technology or just a face-to-face experience, that causes the learning, but rather how the technology, face-to-face session, etc. is used to support the learning process. Your employees are your most valuable and powerful asset. 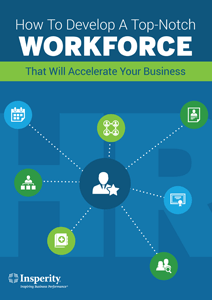 Get our free guide, How to Develop a Top-notch Workforce That Will Accelerate Your Business, a well-developed HR strategy can help you develop a winning team. It is usefull blog for everyone who belongs to the employee training sectors. Got to know alot of things after reading the blog. Keep Sharing such informational blogs. Thanks for reading and sharing your feedback with us! We’re glad you found this article helpful. Succeed! It could be one of the most useful blogs we have ever come across on the subject. You share amazing employee training and development ideas. Thanks for sharing!